The charge that feminism stereotypes men as predators while reducing women to helpless victims certainly doesn’t apply to all feminists—but it’s a reasonably fair description of a large, influential, highly visible segment of modern feminism. The latest skirmish on the gender battlefield is “Women Against Feminism”: women and girls taking to the social media to declare that they don’t need or want feminism, usually via photos of themselves with handwritten placards. The feminist reaction has ranged from mockery to dismay to somewhat patronizing (or should that be “matronizing”?) lectures on why these dissidents are wrong. But, while the anti-feminist rebellion has its eye-rolling moments, it raises valid questions about the state of Western feminism in the 21st Century — questions that must be addressed if we are to continue making progress toward real gender equality. One common response from feminists is to say that Women Against Feminism “don’t understand what feminism is” and to invoke its dictionary definition: “the theory of the political, economic, and social equality of the sexes.” The new anti-feminists have a rejoinder for that, too: They’re judging modern feminism by its actions, not by the book. And here, they have a point. 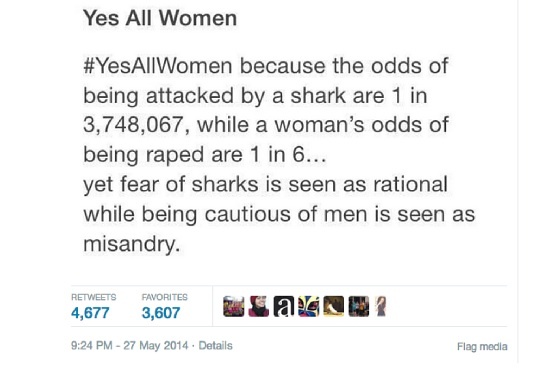 Consider the #YesAllWomen Twitter hashtag, dubbed by one blogger“the Arab Spring of 21st Century feminism.” Created in response to Elliot Rodger’s deadly shooting spree in Isla Vista, California — and to reminders that “not all men” are violent misogynists — the tag was a relentless catalog of female victimization by male terrorism and abuse. Some of its most popular tweets seemed to literally dehumanize men, comparing them to sharks or M&M candies of which 10% are poisoned. Consider that a prominent British feminist writer, Laurie Penny,decries the notion that feminists should avoid such generalizations as “men oppress women”: In her view, all men are steeped in a woman-hating culture and “even the sweetest, gentlest man” benefits from women’s oppression. Consider, too, that an extended quote from Penny’s column was reposted by a mainstream reproductive rights group and shared by nearly 84,000 Tumblr users in six months. Are Women Against Feminism ignorant and naïve to insist they are not oppressed? Perhaps some are too giddy with youthful optimism. But they make a strong argument that a “patriarchy” that lets women vote, work, attend college, get divorced, run for political office, and own businesses on the same terms as men isn’t quite living up to its label. They also raise valid questions about politicizing personal violence along gender lines; research shows that surprisingly high numbers of men may have been raped, sometimes by women. Is there still a place in modern-day America for a gender equality movement? I think so. Work-family balance remains a real and complicated challenge. And there are gender-based cultural biases and pressures that still exist — though, in 21st century Western countries, they almost certainly affect men as much as women. A true equality movement would be concerned with the needs and interests of both sexes. It would, for instance, advocate for all victims of domestic and sexual violence regardless of gender — and for fairness to those accused of these offenses. It would support both women and men as workers and as parents.